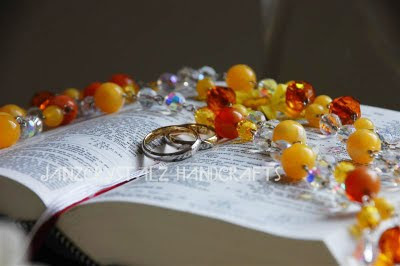 I wanted to make something different and personalized for my big day, thus instead of using the usual cord, I've made a beaded chained like cord using our motif yellow and brown pvc beads accented with glass crystal white beads. Aside from the cord, the jewelries and headdress that I have used on my wedding day were also made by yours truly. The 4-strand chained bracelet, stud-dangling earrings, 2-strand necklace and vine-like headdress, all were made using swarovski crystals and sterling silver. wow! sis you are one amazing artist.. your accessories are really super nice! do you sell them? 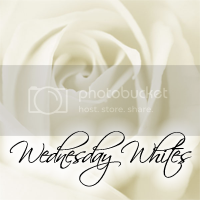 thanks for sharing your whites this week! wow jan its amazing...............ang galing mo ha! next vacation ko anda gyod io ali man visit..
wow..galing! mama loves your accesory tita jan..
Mama Shengkay Orange Tuesdays is still up till tomorrow. You might want to join..
wow ang gaganda sis! pwedeng pagawa din ako? 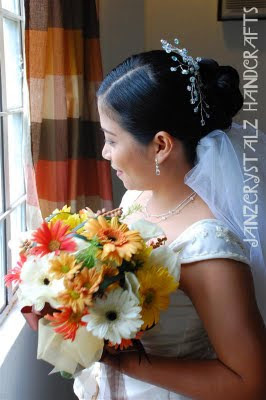 hehehehe..
it's great that you were able to do your own accessories on your wedding day, sis. you're very creative! Galing mo sis!